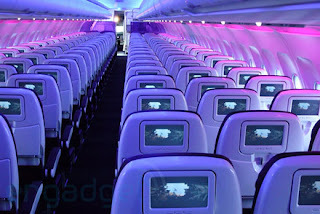 I've had the great opportunity of flying Virgin America and I think I might take a job marketing for them. Ok not really but they're the best, and so cheap too. $79 one way up to Seattle and less than $300 round trip from LA to IAD. You never get bored as you can watch tv, music videos, create a playlist from 10,000 songs and eat when you want. Just swipe your credit card and there it is. It's a winner. Oh and you can chat with randoms...but I didn't venture there. Call me crazy.